Born: 14 July 1867, Tarland, Aberdeenshire, Scotland. Died: 18 August 1943, Aberdeen, Scotland. H. Ross Skinner, son of Reverend William Skinner, served an apprenticeship in civil engineering in Aberdeen and studied civil engineering and surveying there. 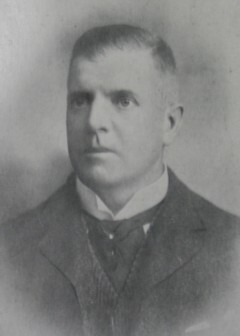 He came to Kimberley in 1889 as assistant manager and surveyor of the North-East Bultfontein and Gordon Diamond Mining Companies, but after about a year moved to the Witwatersrand where he became consulting engineer, and later general manager, of the Durban Roodepoort United Main Reef Gold Mining Company. In 1895 he also became manager of the Vogelstruis Estate and Gold Mines. He married Annie J. Milne in 1893 and they eventually had two sons and a daughter. They resided in Roodepoort. Skinner became a member of the South African Association of Engineers and Architects in May 1894 and served on its council for 1898/1899. In October 1897 he delivered a paper before the association on "Handling and disposing of tailings, sands, and slimes on the goldfields of the Witwatersrand". The paper was published in the Proceedings (1898, Vol. 4, pp. 53-60) and elicited a fair amount of discussion (pp. 135-138, 164-165). During the Anglo-Boer War (1899-1902) Skinner served with the rank of captain in the Rand Rifles (Mines Division) and was awarded the Queen's Medal. Towards the close of the war, in February 1902, the Witwatersrand Native Labour Association commissioned him to investigate the use of Chinese labour on the mines. His report contributed to the importation of Chinese labourers for a few years. Upon his return from China he was again appointed by the Durban Roodepoort Company, with whom he remained to 1911. His continuing interest in military affairs is indicated by his position as second in command, with the rank of major, of the Transvaal Scottish Volunteers from 1903 to 1909. Skinner was a member of the South African Association for the Advancement of Science by 1903, but his membership lapsed at some time between 1906 and 1910. He belonged to various professional associations, including the (British) Institution of Civil Engineers (associate member), the (British) Institution of Mining and Metallurgy, and the American Institute of Mining Engineers. He was a member of the Rand Water Board and president of the South African Association of Mine Managers. In May 1902 he was elected chairman of the Health Board for the Roodepoort-Maraisburg area and when the Board became a municipality in August 1904 he was elected as the first mayor of Roodepoort-Maraisburg. In 1911 he became technical director and consulting engineer of East Rand Proprietary Mines. Skinner left South Africa in 1914 and during World War I (1914-1918) was director of high explosives supply to the British Mininstry of Munitions and later director-general of the Ministry's Inspection Department, before being transferred to the Admiralty Board of Inventions in 1917. He was knighted that same year. In 1916 he was appointed a director of the London based Central Mining and Investment Corporation. At the close of the War in 1918 he returned to South Africa in this position, which he held until his resignation on account of poor health in 1923. He retired to Scotland. South African Association for the Advancement of Science. Report, 1903, 1905/6: Lists of members. South African Association of Engineers and Architects. Proceedings, 1897-1898, Vol. 4. South African who's who, 1919/20.